In a prior post, I spoke about and described what I call “The Twin Jewels Project”. Today I thought I would talk about another of the images that I think has ‘made the cut’ for inclusion. It is also the last of the three for the project that I have used in prior different discussions in this blog. Future images I discuss for this project will be new to the blog. “Water Painting” began as a motion study and ended up as a study in both motion and color. 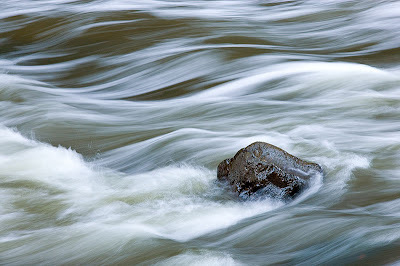 As I was walking by an area of the river that runs through one of the “Twin Jewel” parks, I noticed that there was a lone stone that was disturbing the movement of water going by and I thought it might make for some interesting images if I used a slow shutter speed to blur the water. 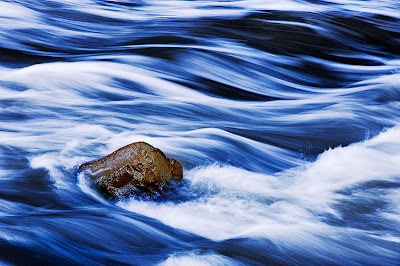 I stayed at the spot for about twenty minutes or so taking shots at various shutter speeds, hoping that some of them would prove to have interesting shapes captured in the moving water to contrast with the stationary rock. I was quite attracted to the preservation of both the shape of the swells as well as the tonal variation. But, in my mind, the image still lacked something; I didn’t feel as if the viewer was drawn into it. It didn’t seem to have that something that makes one want to dwell on and examine all of its nuances. Boosting the contrast was a start, but I felt that what the image really needed was strong color with associated variations in the color tones to go along with the motion. Despite the fact that the color I was introducing was more ‘surreal’ than ‘real’, I felt that it nonetheless transmitted the feeling I was trying to convey when I took the shot. As I worked with the image, I felt that the linear motion blur of the water seemed like paintstrokes that called for the strong color (and hence the image title). Do the saturated colors go to far.......?